WWE has a Smackdown brand house show in Hobbs, NM. Thank you to everyone who has sent their condolences to Dave Meltzer on the passing of his father. Knowing how much Dave appreciates our readers, I'm positive that every message he receives is genuinely appreciated. It's always been obvious how much his parents mean to him and how supportive they've been of him from even reading Dave or listening to him talk. Donald Trump brought WWE into the news today by tweeting a video of him taking down and punching Vince McMahon at WrestleMania 23, but with the CNN logo in place of Vince's head. He has taken to calling CNN the "Fraud News Network" in his never-ending feud with them. Steve Austin attended last night's NJPW G1 Special in Long Beach. 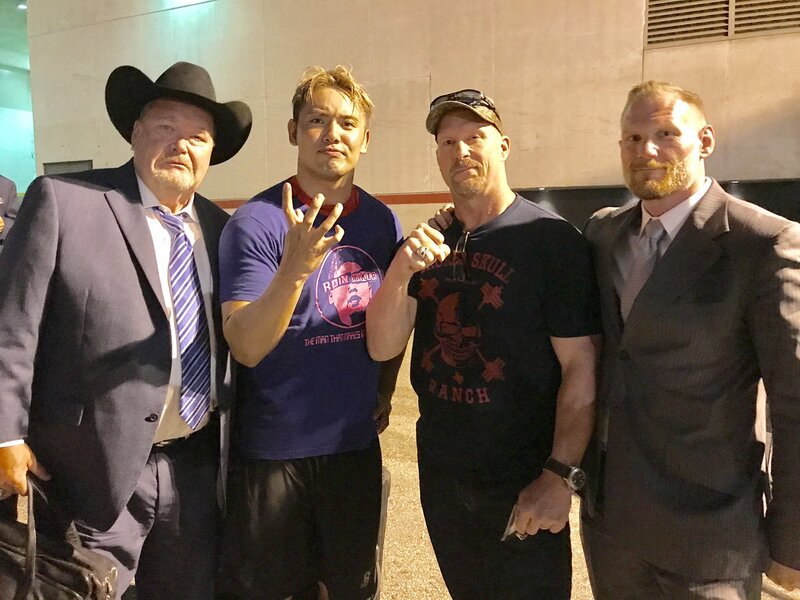 Both Jim Ross and Kazuchika Okada posted a picture with Austin on Twitter after the event. Matt Hardy indicated on Twitter that The Hardys' legal battle with Anthem over the ownership of the "Broken Hardys" characters could be reaching a positive resolution soon: "A MASSIVE 'Thanks' to all the Wrestling Fans that backed #HouseHardy in the latest #GreatWar.. We are days away from winning. KEEP FIGHTING!" WWE has added LED lights to Naomi's SmackDown Women's Championship. After announcing Bianca Belair for the Mae Young Classic, WWE uploaded video of the match where she qualified for the tournament by beating Aliyah. Female referee Jessika (formerly Kennadi Brink on the indies) officiated the match, which may mean that she'll be involved with the MYC. Vanessa Borne defeated Jayme Hachey in the other qualifier at the last NXT tapings. Big E previewed Tuesday's rap battle with The Usos by posting a rap against them on Twitter. Smith Hart passed away today after battling advanced prostate cancer. He was 68 years old and had entered hospice care last month. That bad news for the Hart family unfortunately came on Bret's 60th birthday. Matt Cappotelli provided an update (along with a picture of his scar after surgery) on his health after undergoing surgery after doctors had found that the brain tumor that he previously had has come back. Cappotelli wrote that doctors said that surgery was very successful and they're waiting on tests to come back to decide the next course of action concerning the part of the tumor that's inoperable. NJPW is back in Long Beach tonight for the second of their G1 Special shows. While last night wasn't at the level of the absolute best NJPW shows, I thought it was an enjoyable event that kind of was saved by how good the matches after intermission were. Kenny Omega vs. Michael Elgin was the best match on the show, Tomohiro Ishii vs. Tetsuya Naito was very good, and Kazuchika Okada vs. Cody Rhodes was better than expected. There were issues with production and commentary on AXS, but Jim Ross and Josh Barnett improved a bit later in the show when the multi-man tags were over and they were more familiar with who was in the ring. Last night's show is up on New Japan World for those who didn't watch it on AXS and want to see it. The finals of the IWGP United States Heavyweight Championship tournament will almost certainly be Omega vs. Ishii or Zack Sabre Jr. Omega is facing Jay Lethal, who comes into the match with a storyline rib injury. Omega and Ishii have had two standout matches this year, but him against Sabre would be something different for this show. Cody potentially teased the continuation of his problems with Omega by posting a picture of a towel on Twitter today. Cody and Omega had a confrontation at a press conference last night. In a tribute to Dave's father, Nick Jackson tweeted that The Young Bucks are going to hit the "craziest Meltzer Driver ever" tonight in their match against Roppongi Vice. Cody teased that the Bullet Club will have a "special surprise" planned for the show tonight. The Miami Herald has an article about NJPW earning their first top spot on Twitter's trending topics list last night. Mark Cuban, who is one of the owners of AXS TV, tweeted the story. Dana White told Lance Pugmire of the LA Times that Cowboy Cerrone vs. Robbie Lawler has been moved to UFC 214 in Anaheim on July 29th. White called the card "ridiculous." In addition to that fight, it will have the rematch between Daniel Cormier and Jon Jones for the light heavyweight title, Tyron Woodley defending his welterweight title against Demian Maia, and Cris Cyborg fighting Tonya Evinger for the vacant women's featherweight title. Conor McGregor's coach reiterated that McGregor plans to return to the Octagon after fighting Floyd Mayweather. Alistair Overeem said that he's going to challenge Stipe Miocic after UFC 213. Gabi Garcia will fight twice within 23 days in Japan.